Superstar Mahesh Babu's fans were thrilled to see him posing with his wax statue created by Madame Tussauds from Singapore. Now, they are requesting him to do a duel role movie. 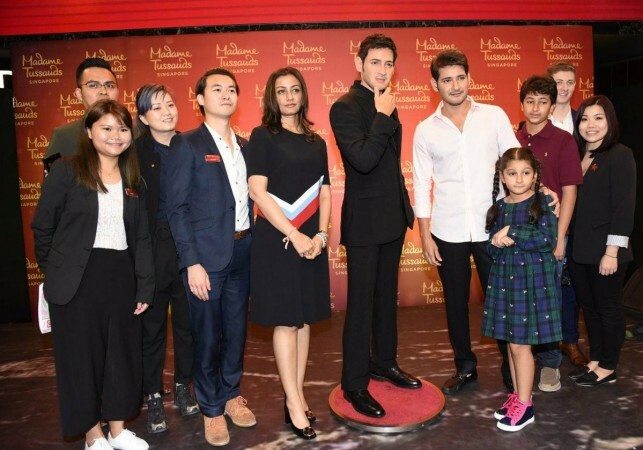 Superstar Mahesh Babu's fans were thrilled to see him posing with his wax statue created by Madame Tussauds from Singapore. Now, they are requesting him to do a dual role movie. The bosses of Madame Tussauds recently announced that Mahesh Babu would have a wax statue, which would be in its museum in Singapore. After months of hard work, the team created his idol and unveiled it in the city. The statue brought to Hyderabad, India today and placed in his Superflex AMB Cinemas in the city. Mahesh Babu himself unveiled his wax statue in AMB Cinemas this morning. He was stunned to see his another him. He took to Twitter to laud the artistry of the Madame Tussauds team from Singapore. He said the wax idol is very close to his real life. The superstar tweeted a couple of photos featuring him with the team of Madame Tussauds team from Singapore. Mahesh Babu also wrote, "My first reaction was... Wow!!! Quite freaky in a way looking at another Me!! Can't get more real than this... Hats off to the artistry & detailing by the @MTsSingapore team. It's unbelievably close to life." Mahesh Babu released another set of pictures on Twitter and thanked all his fans and well-wishers for their love. The actor tweeted, "Thanks a lot to @MTsSingapore team for unveiling the figure in my own city & my country amidst my family, friends & fans. Extremely happy with the response & love, each one has showered on me. I'm very happy, overwhelmed and grateful"
This is for the first time Madame Tussauds organised the prestigious event of launching the wax statue of celeb outside Singapore. Mahesh Babu's wife Namrata, son Gautam and Sitara were present on this occasion. His fans were are extremely delighted to see the photos of his wax statue. Many fans replied to his Twitter post and urged him to do a movie with a dual role. Here are some of their comments. Please plan a dual role movie.. SuperStar !! IAM sure two eyes will not be enough see Two Superstars on the bigggg Screen..